Worthington Hills Dental Gets a New Name and a New Look!!! 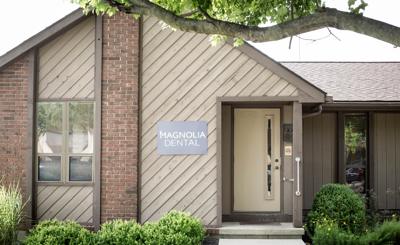 Beginning this month, we’ve changed our name from Worthington Hills Dental to Magnolia Dental at Worthington Hills. We have been confused with other area dentists, so we decided to permanently change our name to something more unique and distinguishable. To compliment our new name, our new grey logo reflects a clean, more modern look. There have been no changes in our ownership or our staff – we’re still the same outstanding team and doctors you have always known and loved! In addition, although we will not officially move until late 2017, this year we will begin construction on a new building which will have higher functionality, more room to hold our growing patient base, and state of the art technology to enhance the fantastic dental care we already provide. As much as we love our old building, we just don’t fit in it anymore! The best part is we’re staying in the neighborhood, moving just down the road to the Mason office park at the first stop light off of 315 North, only a minute away from where we are now. Although we are moving to a new location later this year, we have a new look and growing team, don’t worry! Who we are at the core hasn’t changed at all. We will never lose our dedication to exceptional dental care. We take pride in serving three and four generation families and are determined to continue investing in our community as we have done over the last several decades. 2017 is poised to be our best year yet! On behalf of Dr. Alan Wood, Dr. Bryan Basom, Dr. Richard Flores, Dr, Jenna Renshaw, our new doctor, Dr. Adam Hinkley, and the rest of our team, we look forward to making our new permanent residence and can’t wait to share our journey with you! Happy New Year! !